It was less than two weeks after Donna joined the “Chin Chin” before her superior skill was called out in a review. The pre-show buzz continued with an article on the 14th and again on the 15th with “What Press Agents Say.” Also on the15th there appeared an here-to-unseen photograph of “‘The Four French Dancing Dolls’ in Charles Dilingham’s stupendous production of “Chin Chin, coming to Burns Theater next Wednesday evening.” The woman on the far left looks surprisingly like Donna. Unfortunately, I haven’t been able to find any further sources for the image and can’t confirm that it is Donna. Again, on the 18th, “What Press Agents Say” ran a rehash of “The Evolution of ‘Chin Chin,” which has run in other papers. 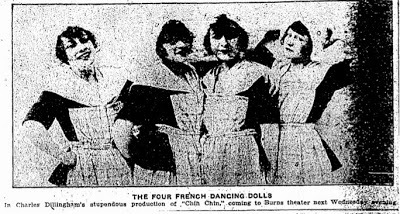 Also, in the newspaper of the 18th, there was a small advertisement by the Burns Theater indicating “Chin Chin” was coming, Wednesday, November 19th. They ran a similar ad on the 19th indicating the show was tonight. The “Chin Chin” of the past and this “Chin Chin’* of the present are two separate and distinct attractions, only distantly related, in fact; yet this current production was gulped down by a hungry audience at the Bums last evening as eagerly as if it had been the original. “Which only goes to show what limited theatrical opportunities will do to a people who are commonly supposed to he somewhat critical. From this it is not to be judged that today’s “Chin Chin” is impossible. It is simply that it suffers by comparison. Were it not that its reputation had preceded it probably it [sic] would have been received without more than a word or two of dissent. For it did offer an evening’s entertainment. Generally, the production is spectacular; somewhat the worse for the handling and a bit faded, but still possessing a glitter that made for friendliness. Numbers produce a sense or activity and a couple of comedians of slapstick tendencies kept things going where musical numbers fall. There is no music worth mentioning. Melodies of years gone by, “Goodbye, Girls, I’m Thru,” “Temple Bells,” “Love Moon,” et cetera, are on the program, but they simply account for so many minutes of playing time, there being no one in the company with a voice, sufficient even to get these over. Yes, there Is music; too; the clown band, a saxophone quintet which aroused, and legitimately, the only real enthusiasm of the evening. Wow, how exciting, Donna “A stunning type” and likely to be remembered. 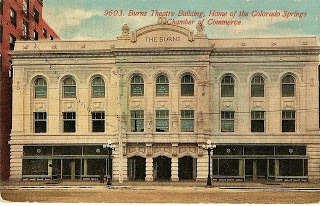 The Burns Theater was built in 1912 for $300,000 on Pikes Peak Avenue near Tejon Street. In 1928 it was turned into a movie house and renamed the Paramount Theater. Several years later it was renamed the Chief Theater. The theater was demolished in 1973 and is now the site for a drive-through for US Bank.